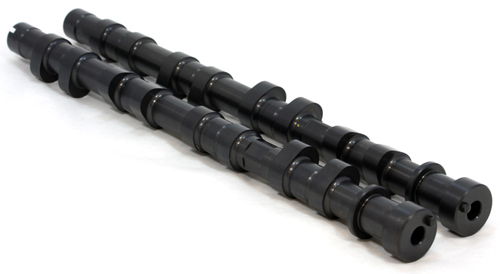 GSC Power-Division Billet S3 cams for the Mitsu Evo 1-3 and first and second Gen DSM cars. The S2 cams are designed for those with more power in mind or a larger turbo. No low end power is lost vs the stock cams when used with the larger turbos. The S2 cams will show gains of 50-70whp over the stock cams and in some cases more in the higher RPMS. Great for 2.0L engines revving to 9000rpms or for Stroker motors revving to 8000rpms. The S2 Cams are suggest to run on our upgraded Beehive valve spring replacement or can be run at the stock revlimit and factory boost on the stock spring. Designed for a rev range of 4000-9000 RPMS(2.0L or 3000-8000 2.2L+), 400-700whp applications. S2 cams can run on Factory ECU with custom flashing. Made 100% In the USA.